I visited Clifton Primary in October to share Danger Zone with the pupils – we had a great time. 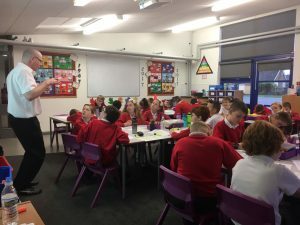 It was lovely to be invited back to write with the Year 6 pupils. We started the session off by discussing nasty characters from books the pupils had read. Lots of great examples featured and it was interesting to discover what the children thought the writers had done to make the characters sound so nasty. We then looked at a piece of text I’m currently working on, which features a particularly nasty character called Bazza. The pupils picked out the language they liked and we discussed the impact of the description. It was a lovely opportunity for me to see if the pupils ‘got’ what I was attempting to describe. After lots of discussion the pupils built up individual plans for their version of my character. The energy and enthusiasm in the room was mega. I loved how passionate and excited the pupils were. 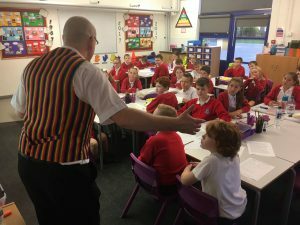 The session finished with an oral storytelling of a new version of the story as I put on the storytelling waistcoat and pinched lots of the children’s ideas. I had a wonderful time working with the brilliant Year 6 pupils at Clifton and would like to thank Mrs Legge for inviting me back. I can’t wait to read some of the finished pieces when the children have had time to write and edit.